Top-Rated Oven Cleaners in East Putney SW15 | RDA Cleaning & Maintenance Ltd. First-Class Oven Cleaners In East Putney SW15. Quality Ensured! Forget about hiring a company with no experience or bad reputation in the field. Chose the company with more than 10 years of experience in oven cleaning services East Putney SW15. Hire the company with more than 5 thousand of new happy customers per year. The company with 96% positive feedback on all of the offered services, including the efficient and innovative oven cleaning. Hire RDA Cleaning & Maintenance Ltd. your friend in maintaining sparkling clean kitchen and cooking organic and safe meals in a hygienic and fresh oven! To get help making your oven look and cook like new - book our professional deep oven cleaning East Putney SW15 service! 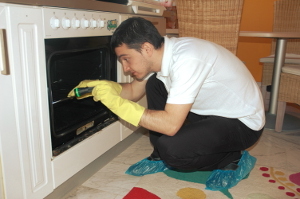 Hurry Up & Book A Trustworthy Oven Cleaning Company In East Putney SW15 Now! RDA Cleaning & Maintenance Ltd. is waiting for your orders and calls for more additional information on this phone number 020 3404 1646! Get a free quote now and you can receive quality oven cleaning service in East Putney SW15 by the end of the day.